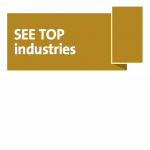 TOP 100 SEE, published by SeeNews is an annual comprehensive, in-depth guide to the economies of Southeast Europe (SEE), providing detailed presentation of the top performing businesses in each country. TOP 100 SEE is the only annual ranking of the top companies, banks and insurers in Southeast Europe. SeeNews is an independent business intelligence provider with focus on the emerging markets in SEE. SeeNews is an independent worldwide provider of business news and market intelligence with focus on the emerging markets. SeeNews is preparing an annual ranking of the best performing companies in the region of Southeast Europe, called SeeNews TOP 100 SEE. Copyright © 2018 SeeNews Ltd. All rights reserved.